On Monday 19 February, LSE Festival opened with ‘The Five Giants and the Ministers Who Made a Difference’. 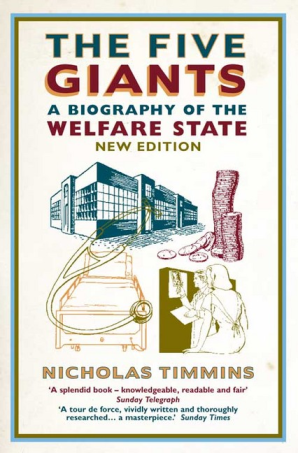 Chaired by LSE Director Minouche Shafik, Nicholas Timmins, author of The Five Giants: A Biography of the Welfare State, and Professor Sir Julian Le Grand debated the key UK politicians who really made a difference when it came to Beveridge’s ‘Five Giants’: listen to the podcast here. Ahead of the event, Nicholas Timmins gives insight into the reception and impact of Beveridge’s 1942 report, as well as its enduring significance in today’s global, 21st-century context. 75 years ago, on 1 December 1942, the Beveridge report, the founding document of Britain’s modern welfare state, was published. Right in the middle of the Second World War, with the country battered by the Blitz and barely past, from Britain’s point of view, the war’s darkest hour. Queues formed around the country to buy it. Copies were dropped into Nazi-occupied Europe. Others were sold in the United States, which, just a year earlier, had entered the war – Her Majesty’s Treasury making a tidy profit on that little exercise. 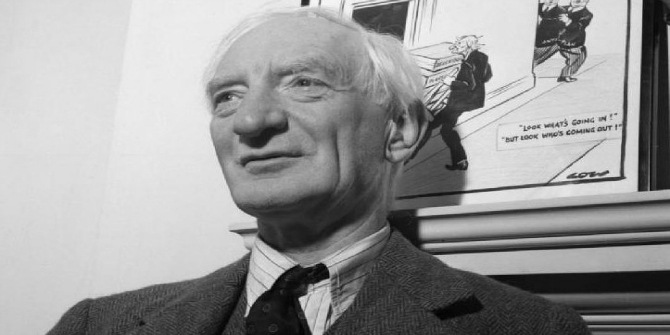 The reception was such that Sir William Beveridge, the report’s vain and egotistical author, described the experience as ‘being like carried on an elephant through a cheering mob’ as the wartime coalition government of the day found itself forced to take the initial steps towards recommendations that a subsequent Labour government largely completed. And out of that came a reformed school system, a modern social security one, a huge post-war home building programme, the creation of Britain’s National Health Service and a policy of full employment. Large though he looms, however, Beveridge ranks second to Bismarck as a welfare state designer. Bismarck’s groundbreaking compulsory social insurance schemes in the 1890s for pensions and sickness in Germany had provided a model for some of Britain’s earlier welfare state measures. And it was that social insurance that many other leading European countries adopted as they too built modern welfare states after the Second World War. Beveridge’s social security system proved very different. In return for national insurance contributions, it provided only a minimum guaranteed income in return, rather than the earnings-related ones that much of continental Europe adopted. And, aside from the Scandinavian countries, Britain differed too in funding its NHS through general taxation, rather than through social insurance. Since then, Britain’s welfare state has gone through many highs and lows, advances and setbacks, which I’ve sought to set out in The Five Giants: A Biography of the Welfare State¸ which tells the story of the 75 years since Beveridge. So much has changed. In the 1940s, the great health challenge remained the infectious diseases. Today it is the long-term conditions, and often multiple long-term conditions, from which the elderly suffer as welfare states around the world have contributed to spectacular rises in life expectancy. A workforce that was hugely male-dominated has happily become one where the opportunities for women have been transformed, even if true equality remains elusive. Britain – after periods when unemployment topped three million – now has something that might just about be described as full employment, but which does not feel like that to many as globalisation and technological change have contributed to ‘zero hours’ jobs, a ‘gig economy’ and low wages that too often feel insecure. In much of Europe, youth unemployment is a major challenge. Education, particularly higher education, has been transformed for the better. And some problems have almost turned on their head. In the 1940s, for example, one of the biggest worries in Britain was poor pensioners. Today, in Britain, pensioners are the household type least likely to be in the bottom fifth of the income distribution, but those pensioners themselves now worry about inter-generational fairness as their children and grandchildren find it harder to make their way in the world. After decades when the importance of inheritance declined, lives are again being shaped by ‘the bank of mum and dad’ with your chances of inheriting housing and other wealth looking increasingly likely to define your place in society. And so on. But for all that, welfare states are still alive – the ‘biography’ in the title of The Five Giants was deliberate – even if demography, globalisation and the on-going effects of the great financial crash of 2008 are putting them all under extreme pressure. Those pressures, new challenges, new answers – not just in the UK but elsewhere – are of course what the LSE Festival Beveridge 2.0 is all about. My minor contribution – one of the more light-hearted bits – on Monday 19 February will be to ask ‘who have been the five giant ministers in each of the five giant areas’ that Beveridge identified. Not least because a little history can on occasion inform judgements about what might and might not work in the future. Nicholas Timmins is visiting professor at the LSE and a senior fellow at the Institute for Government and the King’s Fund. His fully updated Five Giants is published by William Collins. Note: This feature post gives the views of the author, and not the position of the LSE Review of Books blog, or of the London School of Economics.